Between happening and knowing there is a space—a bit of room to breathe before disaster. Everything happens before you know it. This is the gift of light, the laggard. You may think light speedy, and it is true that there is none to beat it in this universe: no hare, no rocket ship, no Kenyan swift of foot can do it better. But light’s tempo has a number, and by those digits it is bound, the same as any shackled lifer. Jean Valjean had 24601; light 299,792,458. Oh, it is a traveler par excellence. Nigh on three hundred million meters per second is nothing to sneeze at. Traveling, though, takes time. Traveling trails behind transpiring. Last week, on a mountaintop dripping with stars, I regarded the Hunter as he drew back his arrow for the Hare. This he has done since Homer. Since Hesiod. It might seem he must do it forever; but he may already have dropped his bow. For Betelgeuse, the star in his right shoulder, is old enough that it must soon die—and distant enough that it may have done already, hundreds of years past. If so we are none the wiser. We stand somewhere in the 640 year-long gap of light’s passage, event on one side and understanding on the other. Before you know it Betelgeuse will blow. Did blow. Will blow. Did blow. I watched the Hunter and his old red shoulder. I wondered at the night sky, so full of Schrodinger’s cats. Between happening and knowing there is a space—no matter how small. 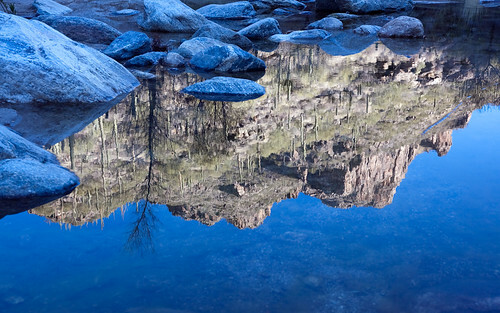 Two mornings later, kneeling over a canyon pool, I saw the Santa Catalinas in still water. Observed the sun moving, ever so slowly, over their graceful bulk. Thought: As with the stars, so with all things. Since they were only miles away, not light years, the light that carried the mountains’ countenance came to me fast, fast, fast—plummeting out of the sky headlong and caroming off the surface of the pool and into my eager eyes so quick you’d never even know there was a time between. An infinitesimal time. Still, there it was. Before you know it—but just before—the sun dapples over the Santa Catalinas. Between happening and knowing there is a space—a bit of room to breathe. Before you know it you’re all grown up. Before you know it you’ve fallen in love. Before you know it he’s become someone else. Before you know it, you have too. You’ll see. Just wait a second. Let light catch up. This entry was posted on February 18th, 2011 at 10:46 pm and is filed under Shorts. You can follow any responses to this entry through the RSS 2.0 feed. Both comments and pings are currently closed. i’m waiting. i’m breathing. in the space between i’m back in that canyon.